From extreme sports to rainforest treks and everything in between, there’s no better gadget to capture life’s wildest moments than an action camera. Naturally, we’ve gone ahead and found the best of the best for you. Action cameras have become a revolutionary corner of the video camera market, allowing users to capture moments and events that would otherwise be impossible to video. 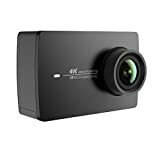 Of course, it’s practically in the item description that the perfect action camera should have a durable design and serve its primary function under virtually any circumstances. Being a camera first and foremost, the ideal action cam should be capable of capturing high quality video and offering an intuitive interface to fiddle with. Of course, there’s no such thing as a perfect anything in technology, but we’re confident that we’ve narrowed the search down to the superlatives. Let’s dive in and look at the best action cameras on the market today. GoPro has essentially become synonymous with the term “action camera” thanks to a long line of stellar products, including 2014’s GoPro Hero4 Silver. Now, GoPro has taken everything we loved about the Hero4 Silver and beefed it up with game changing features that its consumers have been clamoring for, giving us the GoPro Hero5 Black. This action cam is a remarkable achievement for GoPro. While maintaining the same price point as the Hero4 Silver, GoPro managed to stuff indispensable features, including built-in waterproofing, electronic image stabilization, and an optional linear field of view video capture mode. We’ll dive a little deeper into the specifics of those upgrades in a moment, but it’s important to understand that the Hero5 Black is a marked step-up from an already industry-defining device — at no extra cost, to boot. First and foremost, an action camera must be just that — a camera. So how does the GoPro Hero5 Black stack up against the competition? Although there’s not a noticeable improvement over the company’s last foray into 4K videography, this GoPro’s 4K video, as well as its basic high-definition capture, are as sharp as action cameras get. Like most GoPro’s the camera tends to lean towards the cooler side of the white balance spectrum, but the colors are authentic and sharp nonetheless. The electronic image stabilization and linear field of view video capture are milestones in the evolution of the GoPro. Electronic image stabilization helps to reduce the blurriness of a fast-moving subject using special algorithms that can often achieve what optical image stabilization alone cannot. Of course, this isn’t without its downside, as using the electronic image stabilization forces the GoPro to make the frame smaller in order to compensate for the perceived movement, meaning you could end up missing the edges of shot you were looking for in the name of a more stable video. As for the linear field of view, this essentially ditches the GoPro’s signature fish-eye effect in favor of a more straightforward, albeit smaller framing. While the video side is all good and well, it’s the upgraded design and intuitive interface that pushed the GoPro Hero5 Black to the top of our list. Undoubtedly, the most useful addition is built-in waterproofing for up to 33 feet, or 10 meters. By ditching the waterproof case, users can have more freedom with their camera and most importantly be able to capture pure sound without the impedance of a bulky waterproof housing. Of course, if you’re looking to capture your deep seas dive or snorkeling trip, you’ll definitely still want to pick up a waterproof case that can fit around the GoPro Hero5 Black. The interface and touchscreen based tech at work here is a breath of fresh air. With a swift touch response and easy to access menu, changing your settings on the fly really couldn’t be easier. Another nifty and surprisingly useful feature is the voice control function. For something that sounds so gimmicky, it really makes perfect sense for this type of product — one that you often use without the use of your hands. As with nearly everything, there’s a few small drawbacks. For starters, the battery life is ok, but at anywhere from two to two and a half hours with the GPS and WiFi turned off, its pretty much middle of the road. Another annoyance is the optional auto-upload service, which is a great service, but costs an additional $60 a year to use. Also, although the video is clear, it is noticeably more blue than its best competition, making it appear less vibrant before editing. Still, these minor drawbacks aren’t nearly enough to detract from just how great this action cam is. In everything that an action camera is supposed to do, the GoPro Hero5 Black does it best. From industry-standard video and photo quality, a natively waterproof design, and an intuitive interface, the Hero5 Black is the best product GoPro has ever put out — and that’s saying a lot. If you can make the investment, you simply won’t find a better action camera on the market today. If you’re not quite up to the GoPro price tag but still want top-shelf video quality, the Yi 4K Action Camera is a perfect blend of value and quality. Make no mistake about it — this action cam isn’t cutting any corners. The Yi 4K camera offers crystal clear 4K video recording, a slick touchscreen interface, electronic image stabilization, and an even better battery life than the GoPro Hero5 Black. Ultimately, the GoPro outpaces this cam with some unbeatable features, but the Yi 4K should still be near the top of your list if you’re in the market. The recording quality of this action camera is second to none, at the very least matching the GoPro Hero5 Black. Its 4K capability is brilliantly displayed with a vibrant color palate and warm white balance that is even more impressive than our top pick at first glance. The only downside is that it doesn’t offer different color profiles for tweaking in the editing stage, making it important to get the shot you want on the touchscreen display. For your editing and sharing needs, the corresponding app is surprisingly well made and makes quick edits, as well as in-depth changes, a breeze. Speaking of the display, the entire interface is intuitive and well designed, similar to GoPro’s, if not better. The Yi 4K cam boasts a 16:9 wide display as opposed to GoPro’s 4:3 display, making a more natural representation of the final video you’re producing. While in normal circumstances the Yi’s touchscreen allows for speedy settings changes in the middle of the action, its lack of native waterproofing hinders that. The available waterproof case makes the touchscreen inaccessible while the camera is wrapped in the extra housing. Aside from that issue, there’s a few smaller nagging problems with the Yi 4K action cam that kept it out of our top spot, despite being considerable more affordable than the GoPro. Still, if you’re looking for something on the affordable side, the Yi 4K Action Camera is a stellar value that packs a punch with its video. It’s not quite a GoPro Hero5, but the Yi 4K action camera is certainly the next best thing. Although it’s missing some of the key features of our top pick, including a waterproof body, it’s half-off price tag makes up some of the ground. . If you’re not looking to take your action camera parasailing any time soon, the Yi 4K is an excellent choice at a fraction of the cost of the GoPro Hero5. If the $200 price tag is still a little too steep for you, the TomTom Bandit 4K is a superb and affordable action camera option. While the TomTom lacks some of the more noteworthy features of our top pick, including a touchscreen interface, built-in waterproofing, and digital image stabilization, this action cam makes up for it with stunning video capture and a great app. At first glance, the TomTom’s video looks a lot like the GoPro, displaying a cool-leaning white balance and the signature fish-eye effect. While the Bandit’s video capabilities don’t totally match up to GoPro or Yi’s quality, the 4K, 2.7K, and 1080p modes are all visually stunning for the price tag. As with the GoPro, most of the finer tweaking will be done in the editing stage. Speaking of that, the TomTom has a very nifty “highlight” tagging feature that can really expedite the editing process. In addition to the Bluetooth and GPS that’s onboard, the Bandit features motion sensors that can tag your high-octane videos when you hit your max speed, rotation, or heart rate (if you’re wearing a Bluetooth paired monitor). When you connect your camera wirelessly to the app, these tagged moments will be front and center, making it a breeze to comp together your highlight reel from the app. If that’s still too much editing for your taste, you can literally just shake your phone and it will throw some highlights together. It’s that easy. Overall, the app is likely the Bandit’s strongest asset. From the “Create a Story” in the app’s menu, the user can take their highlights and move them around in any order imaginable. Once you’ve chosen the layout of your story, you can either keep the sound or replace it with music, and if you’re on an iOS device, you can overlay the video with some of the sensor data that the TomTom Bandit picks up during the action. Physically, the Bandit isn’t as much to ride home about. Although it’s sturdy enough, the lack of a touchscreen interface can be frustrating when quick changes are needed. On the upside, the camera’s quick release clip allows for speedy camera angle changes, as well as quickly reaching the desired horizontal angle. The TomTom Bandit 4K is not a “cheap” camera by any means, but rather a high quality, affordable entry into the world of action cameras. Although it lacks some of the upgraded features of our top two picks, it packs a punch where it counts, delivering stellar 4K video and a great app to back it all up. If you’re looking for a premium action camera at a fraction of the cost of the GoPro Hero5, we have no hesitations recommending the TomTom Bandit 4K.